It’s raining. 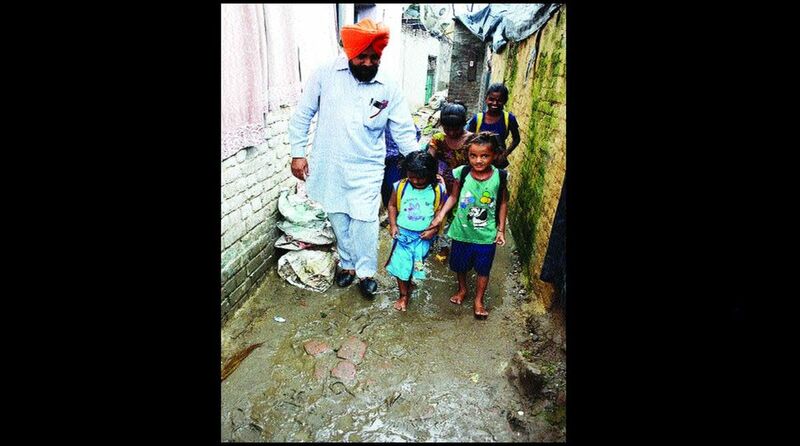 A road clogged with filthy water leads to a small room (just 12 feet by 10 feet) in the Tafazalpura slum area in Punjab Chief Minister Amarinder Singh’s home city, Patiala. The room made of brick walls and covered with roofing sheets (on top and two sides) is full of slum children up to 18 years old. Some are in school uniform and others in casual clothing. They wait anxiously for a man who has literally been playing Santa to them not just at Christmas but all year round. When the unassuming, modestly-built Bhan Singh Jassi enters, the children’s eyes light up. Simply dressed in a Punjabi kurta-pyjama, the turbaned Sikh has travelled about 100 kilometres from his home in Sangrur to visit the children of the centre run by his non-governmental organisation (NGO), Guru Nanak Dev Charitable Slum Society. A few turbaned men are already waiting for Jassi and are ready with their gifts for the children who live in the slum – mostly just makeshift single-rooms with tarpaulin-roofs. Their parents are engaged in rag-picking or do odd jobs. Among the donors invited today by Jassi is a young Sikh, Harsimranjit Singh Turi, who has come to donate plastic chappals to over 150 children of the study centre in memory of his grandfather. Another person donated notebooks for the children after getting to know of the centre when five of its children recently made news for their achievements in the 10+2 examination results. Of these five children, Rahul, the son of a casual labourer scored 88 per cent marks, a record at least for the slum where going to school was unthinkable till a few years back. Eighteen-year-old Kartik is another success story of the slum. She has just completed a Bachelor’s in Computer Applications (BCA) and intends to pursue a Masters’ degree. Some others are pursing degrees in science and Arts streams. “Besides providing us the space to study, teachers here help us in clearing concepts and doubts about the syllabus taught in the class,” Kartik said. Slowly but surely such success stories are becoming common in the study centres run by Jassi in slums. It all started way back in 2003 at Jassi’s hometown, Sherpur (Sangrur). Working as a lineman with the Punjab electricity department, he would see scantily dressed, barefoot slum children while dropping his two children to the school bus. “It was painful to see little children in such a pitiable condition and not going to school. So, one day I went to the slum near my house and asked the parents (mostly snake charmers and rag-pickers) to send them to school. But they refused. 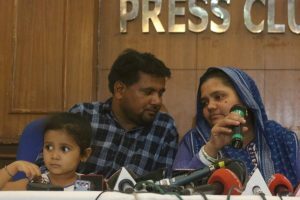 They told me it’s not in their destiny to go to school and like them, rag-picking was their future as well,” Jassi told The Statesman. Refusing to give up, Jassi befriended slum children by distributing toffees to them for a week and then told them to join evening classes at a place in the slum. Employing 20 part-time teachers, Jassi now runs similar evening study centres at six places – Sherpur, Barnala, Longewal, Sangrur, Dhuri, Patiala and Sirhind – in four districts without any government help. Besides providing free tuitions to about 1,000 children, Jassi arranges finance to cover their other expenses, including fees at colleges. Having won the trust of some good Samaritans including non-resident Indians, Jassi regularly gets shoes, chappals, school bags, reading material, stationery, sweaters and uniforms for the children. One such donor, Yadvinder Singh Kala said, “I heard about Jassi and his work. Then I found out about it on my own. I talked to my son in the USA and he is sending money for five years now,” he said. A teacher at Patiala centre for over 10 years, Baby Sharma said it took time for them to mentally prepare the children for education. “They had tangled hair and there was hardly any hygiene. Now these children are so clean and good looking that people don’t believe that they live in a slum,” she said. Sharma lamented the fact that the centre lacks a toilet and doesn’t even have a tap. “It’s very difficult for the girls to go out for toilet as they face harassment. We request Prime Minister Narendra Modi ji, to give us a toilet. We can teach anywhere but a toilet is a must,” she added. “It was difficult for slum children to clear one class in the past, but these children are doing so well in studies. I am happy that we are working in slums where people don’t enter without covering their nose. We are contributing where even the government initiatives for universal education have failed,” he said.